Hillary Rodham Clinton and photographer Kristen Blush view The Revolution Is Female, a photography book by Kristen Blush. Photo by Nick Merrill, 2018. The Revolution Is Female is a hardcover, 128 page photography book that celebrates Hillary Clinton’s historic candidacy, her enthusiastic supporters, a fierce feminist movement, and beyond. Through powerful imagery, The Revolution Is Female documents the profound influence that Hillary Clinton has had on our quest for an inclusive, feminist society, and marks a time in our American history that cannot be left behind. The Revolution Is Female includes three chapters: I’m With Her, celebrating Hillary Clinton, her campaign, and her enthusiastic supporters, Resist, representing the fierce feminist movement that rose from the ashes of an illegitimate election, and Onward, marking our persistence and progress as resilient women in politics, healthcare, arts, finance, and beyond. Blush included submissions and quotes from women in the movement, as well as an oil painting by artist, TL Duryea, from her daily political portrait project. The Revolution Is Female allowed Blush to travel by art car from Bisbee, Arizona, to Sonora, Mexico, where she photographed the children living near the border at Studio Mariposa, a grassroots art and music space created by artist, Gretchen Baer. She visited Washington, D.C. and Albany, New York, to photograph March For Our Lives and Planned Parenthood Day of Action, and was invited by Rebecca Brubaker to photograph her exclusive interview with Hillary Clinton for her documentary film, To All The Little Girls. On February 11, 2018, during the pre-order phase of the book, Hillary Clinton joined the project. With two words, “Love this!”, Clinton helped rally the enthusiasm needed to print 800 copies of The Revolution Is Female. Hillary Clinton pens a heartfelt thank you note in Blush’s personal copy of The Revolution Is Female. The Table of Contents page features the buttons collection belong to Kristen Blush, many of which she designed using her originally photography. The Book is Born at Shapco, Inc.
Kristen Blush traveled to Shapco, Inc, in Minneapolis, MN, to give the final approvals during the 8-color pressing stage of The Revolution Is Female. 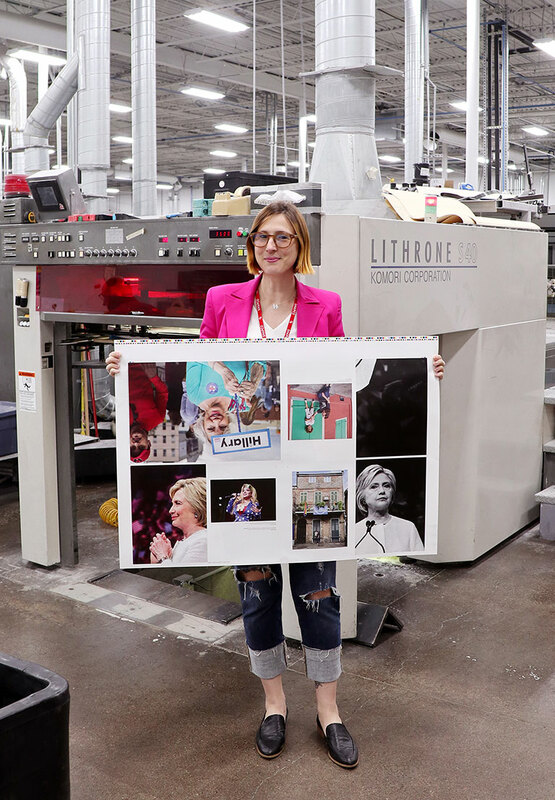 Kristen Blush stands in front of the 8-color press at Shapco, Inc, with pages from her book The Revolution Is Female. June 2018. Kristen Blush and Gary at Shapco, Inc, make approvals on the front and back cover of The Revolution Is Female. June 2018. 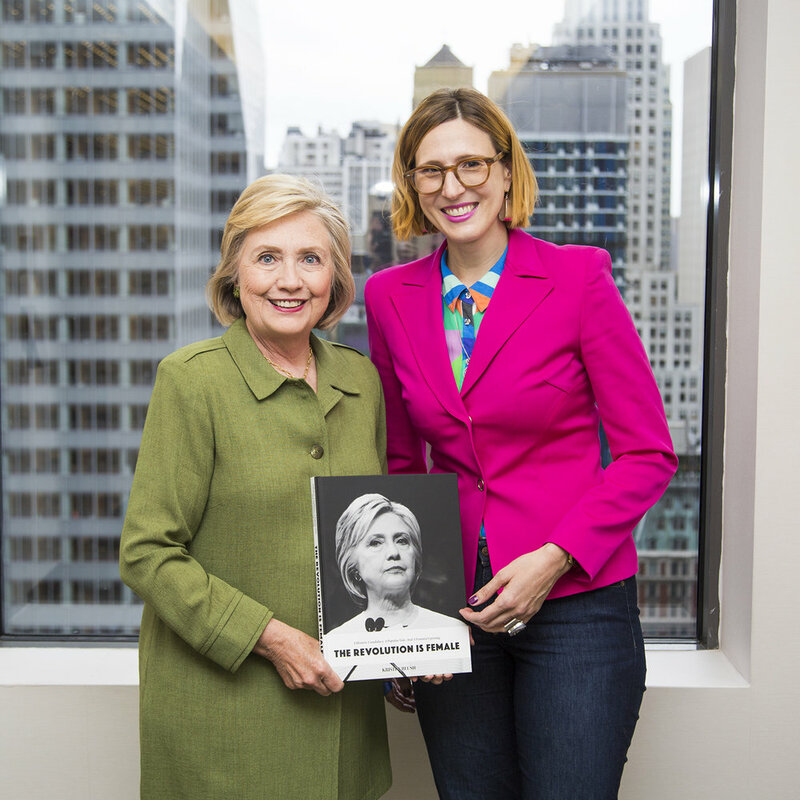 Hillary Rodham Clinton and photographer Kristen Blush pose with a copy of The Revolution Is Female. Photo by Nick Merrill, 2018. The Revolution Is Female was welcomed into the Monographs section of the Library of Congress in 2018, as well as the William J. Clinton Presidential Library and Museum. Blush received letters of recognition from U.S. Senator Kirsten Gillibrand, Governor of New York Andrew Cuomo, Lt. Governor of New York Kathy Hochul, President Bill Clinton, and Justice Ruth Bader Ginsburg, as well as ground support from New York Attorney General Letitia James at Blush’s book signing event at artist Jill Platner’s jewelry gallery in New York City. Kristen Blush and New York Attorney General Letitia (Tish) James pose with a copy of The Revolution Is Female at Blush’s book signing event.